Light without exaggeration be called a sourcelife for plants and the main condition for its successful growth. Without the light reaction of photosynthesis is not possible, providing the power plant, and it can slowly die of hunger. With a lack of light the plants become weak and can not resist pests and diseases. 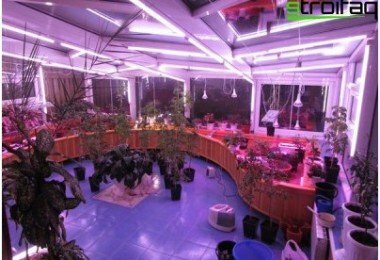 At room conditions, as well as in greenhouses and hothouses of natural light is not enough, not only in winter, but in summer, and therefore additional lighting plant of electric lighting devices is one of the main factors of successful growth and health of ornamental aquarium and even a vegetable green pets growing up in our conservatories and window sills. If your pets are near the greenwindows on the glassed-in terrace or balconies, they are likely to require periodic supplementary lighting, which will compensate the lack of natural light and a positive impact on their growth, development and flowering. In this case, the choice of lamps does not matter, as the use of dual-mode timer relays allow automatic plants provide the necessary amount of light in the mornings and evenings. 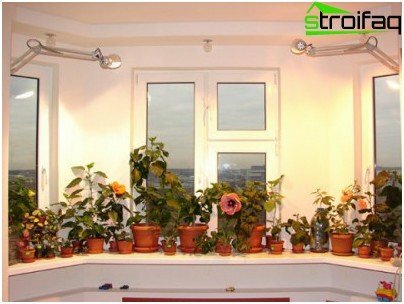 Quite often there is a plant growingunder artificial light, that is, in rooms without windows or in remote corners of the windows of the room. 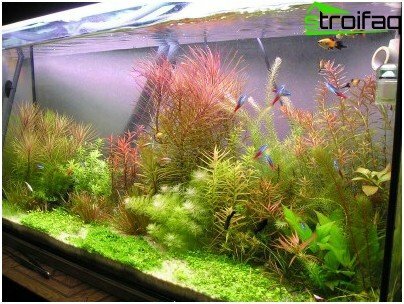 In a situation where your plants are generally not familiar with natural daylight, for them it is necessary to choose a lamp with a special spectrum corresponding to the needs of indoor or decorative aquarium greenery. To choose the right lamp for lightingplants, each florist you must remember from school physics course that is the lamp power, luminous flux, illumination, what they do and what units are measured. electric lamp power measured in watts. Luminous flux - the main characteristic of the light source, measured in lumens, and the higher the score, the more light the lamp. Illumination - a characteristic of the illuminatedthe source of the surface light is measured in lux. From indicator illumination it depends how long it takes to illuminate a given surface area. The amount of ambient light is inversely proportional tothe square of the distance from the light source to the surface. That is, raising the lamp is only 50 cm above its previous level, for example, half a meter above the plants, we are increasing the coverage area, but reduces the light level by 4 times. The light level depends on the angle at whichLight is directed onto the surface. By analogy with the sun at its zenith, the light source projector type will provide maximum lighting if it is perpendicular to the illuminated area. Natural or artificial light - it iscollection of electromagnetic waves of different lengths, called the light spectrum. The spectrum of light is composed of spectral components parts, each of which corresponds to a portion of the spectrum of a certain color, visible or invisible. The visible part of the spectrum is perceived as white light vision and invisible - is ultraviolet and infrared radiation. All parts of the light spectrum play an important role in plant development. In the process of photosynthesis, chlorophyll and otherplant pigments with the participation of the world absorb carbon dioxide and release oxygen, converting light energy into the energy needed for life. Moreover, "working" in the reaction of the pigments used light red and blue portions of the spectrum. The development of the root system, flowering and ripening fruit "supervise" pigments, which is a peak sensitivity in the red part of the spectrum. Properly arranging grow light in one or another part of the spectrum and changing the duration of the periods of light and dark, you can speed up or slow down the development of the plant, reduce the growing season or to control other processes. color rendering index CRI lamp characterizes the matching color of the illuminated object its true color, measured by the value from 0 to 100. For example, the markings on the tube "/ 735" meansthat is a device with the characteristics of CRI = 70-75% and CCT = 3500 ° K, and the marking "/ 960" describes a lamp with a CRI = 90% and CCT = 6000 ° K, the emission color which is close to daylight. It is important to remember! In the light of the lamp used to illuminate the plants must be present and the colors red and blue parts of the spectrum. Inside the bulb of these lamps is injected a mixture of xenon and krypton gases, providing a bright glow and durability of the spiral filament. It should not be confused with gas-discharge metal halide lamps. In the light of this kind of glass is added to the alloyneodymium which absorbs light yellow-green part of the spectrum. As a result, the neodymium light bulb illuminated surface appears brighter, although the amount of light emitted is not increased. A common shortcoming of incandescent lamps isabsence in their spectrum of blue light and too low luminous efficacy of 17-25 lm / W, and so for the lighting of plants, they are not very suitable. In addition, tungsten is too hot and the location at an altitude of less than 1 meter, they can cause burns plants, and at an altitude of more than 1 m are not able to provide effective lighting. 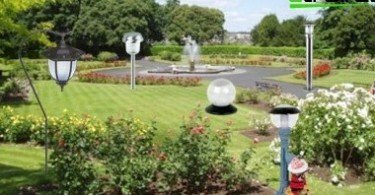 high pressure - the scope of this type of lamps is much wider, from street lighting to illuminate the objects of special purpose. To connect all types of discharge lamps forexcept for the latest models of energy-saving fluorescent devices require special Ballasts - Ballast, despite the fact that the base of some of them looks like a conventional incandescent lamp socket. Fluorescent lamps are low-pressureis a glass tube, which on both sides of a pair of electrodes disposed interconnected tungsten coil. Inside the tube is a mixture of inert gas and mercury vapor, and the inner surface of the glass tube, the flask is covered with a special compound - phosphor. As a result, the electric discharge in mercury vapor generated invisible ultraviolet radiation into visible transformable phosphor white light. There are three types of fluorescent lamps. Lamps of this type are widely used forlighting facilities, have a high luminous efficacy of 50-70 lm / W, low heat radiation and long service life. They can be used entirely for the periodic supplementary lighting indoor plants, but because of the limited range of the use of such tubes for regular home lighting greenhouse is not always optimal. This type of fluorescent lamp is different frompreceding composition of the phosphor material applied on the inner surface of the glass tube. As a result of improvements in range of the emitted light is close to the spectrum of a lamp, which is essential to plants. For the same power, the lamp emits more light is the "useful" part of the spectrum, and is therefore suitable for every need: whether you want full coverage for indoor plants, periodic supplementary lighting or decorative lighting. The main difference between this type of fluorescent lamps from the previous two is in the built-in ballast base, due to which they can be easily integrated into any scheme lighting apartment or at home without additional costlyapparatus that is simply screwed into the cartridge any suitable size. As a worthy replacement for conventional incandescent lamps as a lighting device, not a wide range of compact energy-saving lamps are not able to provide effective lighting of indoor plants. 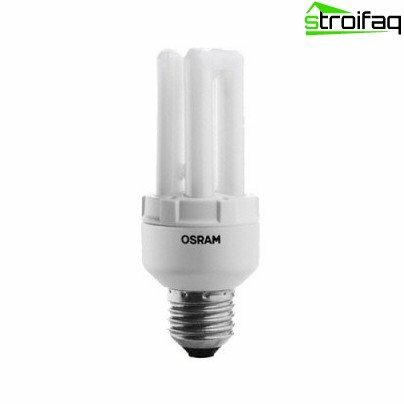 In addition, a significant disadvantage is the size of the bulbs: compact fluorescent lamp power of 20 W (corresponding to 100 W incandescent lamp power) can be used to illuminate only a small group or a stand-alone plant, placed at a height of 30-40 cm. Are more effective as lightingPlant compact fluorescent lamps High-Power 36-55 watts. 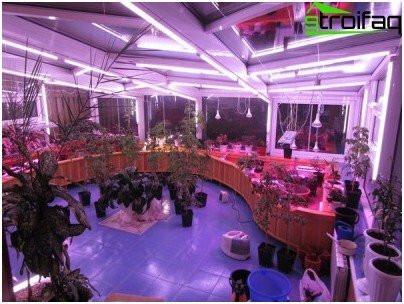 From conventional fluorescent lamps, they have a higher light output and long life, and their excellent light transmission CRI = 90% and a wide range containing the red and blue colors, plants are able to provide comfortable lighting. 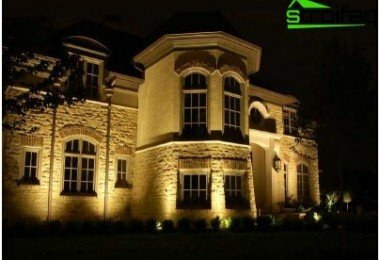 Use these lamps with reflector is recommended in cases where the home flower garden lighting is sufficient total capacity of lighting is not more than 200-300 watts. So far, only the lack of them - too high a price, and the need to connect the electronic ballast. metal halide, which is sometimes called metal halide. The oldest generation of discharge lamps. 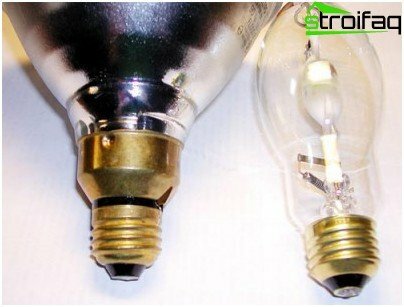 If the inner surface of the bulb is not coated, it has a very low coefficient of color and an unpleasant bluish color of the radiation. the latest generation Mercury paws are covered from the inside with a special compound that improves their spectral characteristics, and some manufacturers even have adapted this type of lamps for lighting plants. But the disadvantage of low light output is not eliminated. Effective bright lamp with a highlight output characterized by a very long service life of 12-20 thousand. The range of hours is represented by sodium lamps, mainly the red zone, the regulatory processes of rooting and flowering plants. 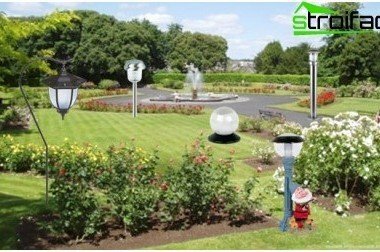 One discharge sodium lamp power of 250 W, equipped with built-in reflector, can effectively cover an impressive area of ​​the winter garden or a large collection of plants. For the balance of the emission spectrum is recommended to alternate sodium lamps with mercury or metal halide. 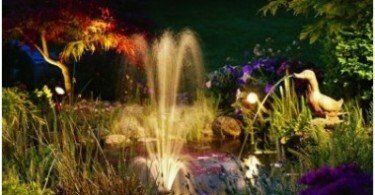 The most perfect type of gas-discharge lampsas lighting for the plants. Characterized by high capacity, long service life and optimally balanced, comfortable for the plant variety. 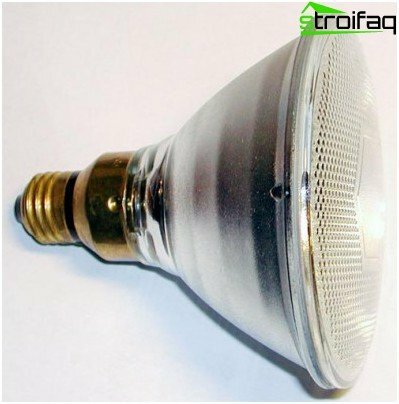 To connect the metal halide lamp requires a special cartridge, despite the fact that outwardly its base is virtually identical to the cap of filament lamp. The drawback - too high in comparison with other types of lamps cost. Unlike all used to illuminateBacklight devices or plants LED lighting device - it is not light, and solid state semiconductor device which has no fragile glass bulb filled with gas unsafe, and unreliable filament moving elements. Radiation in the LED is generated by passing electric current through a special artificial crystal. The main energy is consumed at the same time to create a luminous flux, the process takes place without generating heat - a very important advantage that allows to create the perfect lighting for aquarium plants suffering from overheating. Progressive LED lightening for plants of any type is considered to betechnology of the future. LEDs offer unbeatable resource of up to 100 thousand. Hours of continuous operation, consume 75% less energy compared to conventional lighting devices and can provide comfort for the development of the emission spectrum of plants. It is very important that in the absence of radiation from ultraviolet and infrared parts of the spectrum ensures complete safety of LED lighting for people and plants. 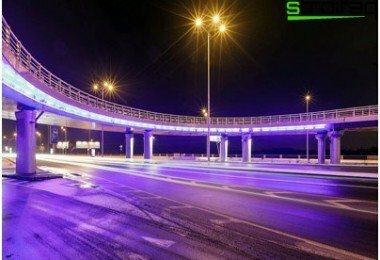 Color LED lighting depends on the compositioncrystal, through which electric current flows, and the radiation intensity can be adjusted by varying the current. If one illuminating device consists of a few crystals, each of which emits light of a certain part of the spectrum, it is possible to control the current strength of each. The only drawback of the LED light sources - they are quite expensive compared with conventional lamps. Thus, the choice of lighting allows each grower, regardless of budget, to create normal lighting for your plants. The cheapest option - incandescent or compact fluorescent lamps with integrated ballast, which are suitable to the usual patrons. To highlight a small number of closespaced low plants are ideal compact fluorescent lamps. High-standing plant cover best projector type lamps sodium-vapor lamp low power up to 100 watts. Placed on shelves or windowsillsplant about the same height, it is best to cover the extended or compact fluorescent lamps of high power. Using a reflector with fluorescent lamps significantly increases the useful stream of light. 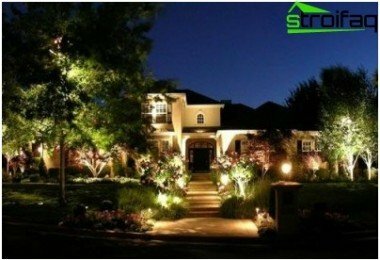 For lighting a large winter garden or extensivecollection of plants you can use one or more ceiling fixtures with powerful (250 m) HID sodium or metal halide lamps. 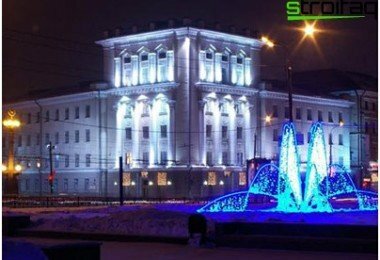 Finally, for each of the above casesideal for modern LED lighting, high costs which more than offset the comfort, luster green leaves and flowering buds raznotsvete your pets.